I went to Mercy High School in Red Bluff, CA. It is a small school a block off Main St and within site of the Sacramento River. Now there’s a Taco Bell and a muffler shop across the street, but it was the Mt. 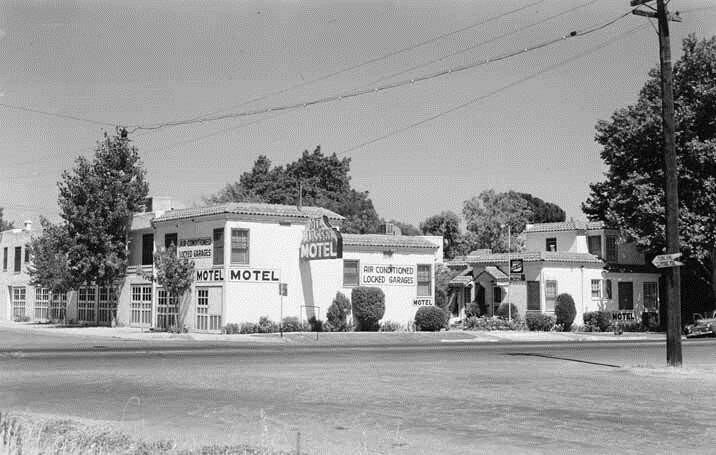 Lassen Motel during my tenure. It seems that the motel got its start in the late 1940s. I’m certain it was a decent enough place in the beginning but, by the time I hit high school, it was the sort of place where all the residents lived there full-time. There was a prostitute named Lena who lived on the top floor facing the school. She loved flashing us from her window or propositioning the basketball team when were getting back late from away games. One of the guys in my class (I can’t remember who) went up and talked to her once. He said nothing happened and she was perfectly nice. My favorite characters were the albino twins, brothers in their early 20s with giant white afros. They always wore matching jean jackets as they walked, squinting, down the street to Hal’s Eat-em Up. They tore the motel down sometime after I graduated. The story was that the high school was inundated by fleeing rats.